Tsuga heterophylla is native to West North America, Alaska to California, where it can reach heights of 20-40 metres; also found in forest from the Himalayas to North Burma, West Vietnam, China, Taiwan and Japan. 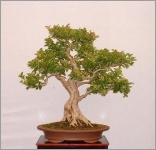 A graceful and evergreen tree growing at a fast rate. 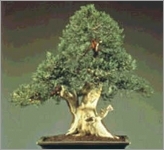 Evergreen tree with a straight trunk, down-swept branches and open, pyramidal crown with a nodding tip. Foliage color ranges from light green/yellow on new growth to dark green on older growth. Tsuga species feature flattened, usually linear leaves, similar to that of Yews, with silvery white bands beneath. 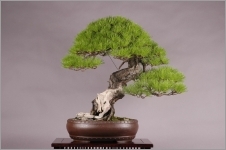 The needles provide a flat branch pattern, lending itself to bonsai design. The leaves have rounded tips, 2-ranked and short, 1/4 to 3/4 inches long. Tsugas are typically tall, graceful trees with spreading branches that droop downwards at the tips creating a cascading effect. The twigs are yellow-brown, flexible, and minutely pubescent. Young bark is thin, superficially scaly, and brown to black. On mature trees bark is dark brown to reddish-brown, becoming thick and strongly grooved with age. The bark becomes deeply furrowed with age. Inner bark is dark red streaked with purple. It is in leaf all year, in flower from April to May, and the seeds ripen from October to November. The flowers are monoecious, individual flowers are either male or female, but both sexes can be found on the same plant, and are pollinated by Wind. The cones are small 1.5 - 2.5 cm long, greenish, turning brown with age and hang from the ends of the branchlets. After dropping their seeds they remain on the tree for quite a long time.